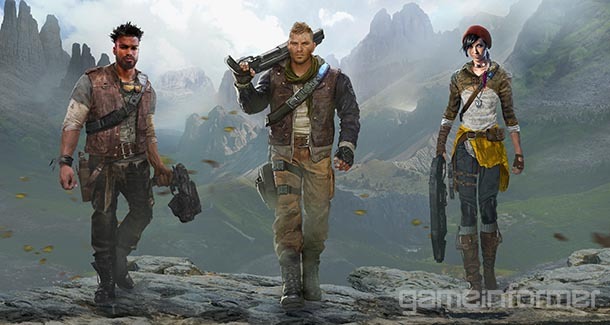 Not content with creating just one new class of enemies, Gears of War 4 developer The Coalition has this week unveiled a second all-new faction. This time, they’re robots. 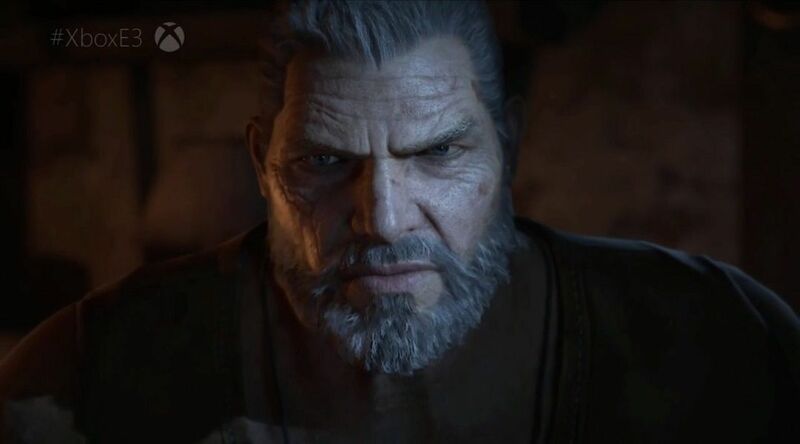 The unveil comes in a new campaign video, courtesy of IGN, which features grumpy old man Marcus Fenix leading the new generation through his burning home, while fussing about his tomatoes – a fixation he has apparently inherited from his old buddy Dom. The eight minute clip gives us our first look at the ‘DeeBees’, robotic shock troops that come in at least four flavours. First up is a small, rolling drone that seeks the player out before exploding, much like Gears 2‘s ticker, and just like the tickers you can swiftly boot them clear. Next up are two humanoid units, one a fairly normal-sized adversary, the other a much larger, sturdier variant called a ‘heavy’, which comes equipped with a short dash to help it evade fire, close distance or even hurdle straight over cover. Lastly, and most interestingly, there’s the Guardian, a shielded airborne unit somewhat reminiscent of Halo 2‘s Enforcer sentinels. 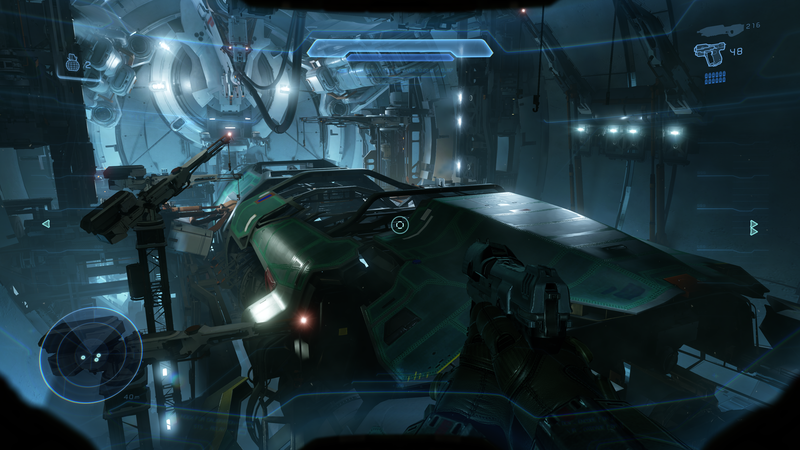 Of course, this new class also brings fresh weaponry to the fight, and all four new guns look like a treat to use. The Enforcer immediately calls to mind Halo 5‘s SMG, though perhaps a little rangier, while the chunky, rectangular Overkill looks like some kind of super-shotgun, absolutely shredding enemies at close range. Then there’s the Embar, a railgun-type rifle that charges up to deliver enormous damage at more of a distance. Lastly, we have a successor to the Mulcher, a triple-barrelled monster called the Tri-Shot that seems like an amalgamation of the aforementioned chaingun and Gears 3‘s utterly ridiculous One-Shot. One thing that comes to mind watching this new footage is quite how powerful these new weapons look, and it makes me wonder if that means we’ll see these new enemies used fairly sparingly throughout the campaign. Of course, there’s the question of where these ‘DeeBees’ come from, and I wonder if that name is itself a hint, with their creator perhaps being the original trilogy’s resident smart-arse Damon Baird. He’s portrayed throughout the series as a man who can make anything with two sticks and a piece of old gum, so it stands to reason he’d be building things for the new government in a post-war world. They’re clearly out to get JD, Del and Kait – the former two having deserted – and I wonder if they serve as a means to make the Coalition of Ordered Governments something of an antagonist without the developers having to resort to human-on-human combat, something fans didn’t take to very well with 2013’s Judgement. While the DeeBees are something new thematically, they do mostly fall back on established archetypes, and along with the Swarm drones’ familiarity to the dearly-departed Locust, fans may be feeling that The Coalition are playing it a little too safe. 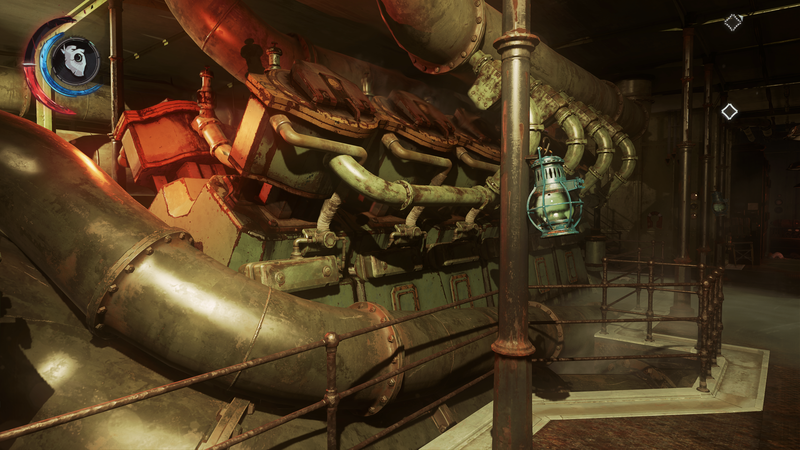 Though as Rod Ferguson, head of The Coalition, has previously said, the team need to do it right before they can do it differently – with their first game, they need to prove they understand the fundamentals of Gears before they go too crazy with it. 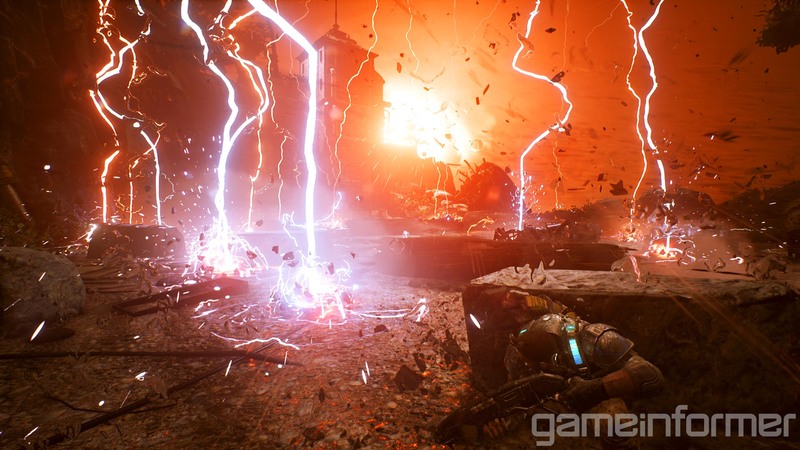 Happily, everything we’ve seen of Gears of War 4 so far suggests that the Vancouver team know exactly what they’re doing, with their game looking like a proper Gears campaign, but with the addition of some shiny new toys – and some seriously inclement weather – to play with. 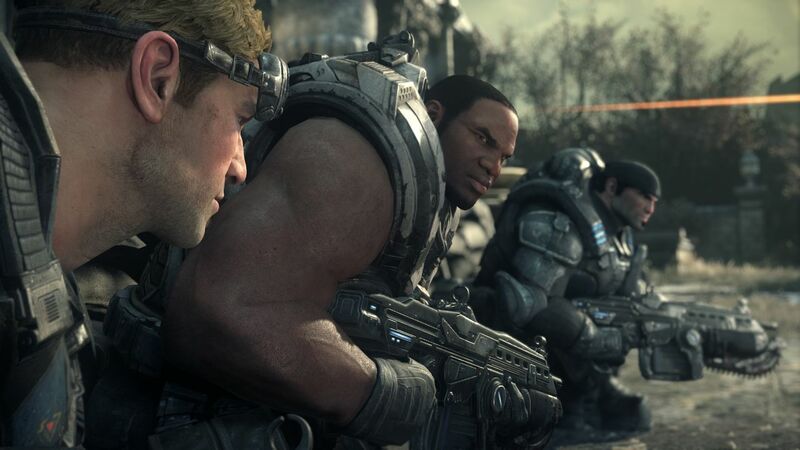 It’s more than two years since Microsoft acquired the Gears of War IP from Epic, and a good nine months since The Coalition unveiled their newest title in the third-person shooter franchise at E3 last year. But for all the familiar elements – the chunky armour, the chainsaw bayonets, the destroyed beauty and the waist-high walls – that reveal didn’t really tell us much. Who were these new characters? Where were they, and what were they doing? Were we even on Sera anymore? 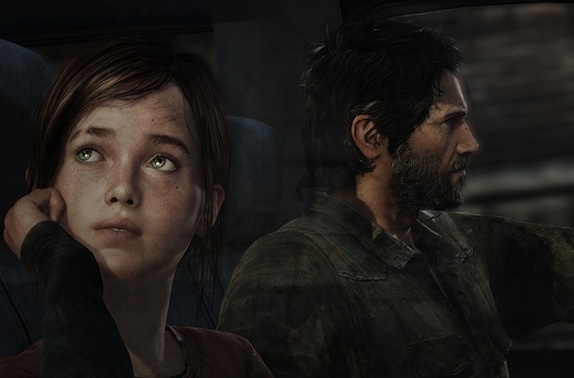 Now, new details have emerged in a Game Informer cover feature. Set 25 years after the climactic events of Gears of War 3, Sera is a very different place. Though it is a time of unprecedented peace, the remnants of humanity now live in walled cities, while violent windstorms batter the planet, an effect of the Imulsion bomb set off at the end of Gears 3. A community of Outsiders – think Stranded, but not nearly so downtrodden – live apart from the COG in their own villages, preferring a freer existence. Into this strange new world come our three protagonists, JD Fenix, Delmont ‘Del’ Walker, and Kait Diaz. The son of the original trilogy’s Marcus Fenix, JD has gone AWOL at the start of the game for reasons unknown, followed by his fiercely loyal childhood friend Del. Taking refuge in an Outsider community, they meet Kait, daughter of the village’s leader Reyna, and described as a capable survivalist who offers a different perspective on the world. When all of Kait’s people are kidnapped, dragged off into the night, the trio set out into the deep, dark woods to look for them, and uncover the mystery behind the Outsiders’ disappearance and the arrival of a grave new threat to the people of Sera. Rod Fergusson tells Game Informer that the goal for Gears 4 is to return to that darker, more intimate feeling the first game had, which often felt like four soldiers standing against the night. “It felt like, as the series progressed, we lost some of the intimacy,” said Fergusson. “The first Gears was a little bit darker and spookier, a little bit more bogeyman under the bed. But as you went through two and three, especially three, Gears became more of a World War II game where the Locust essentially became Nazis in a way. Because the scale had grown, you had gone from this sort of incursion behind enemy lines to a war at a planetary level. 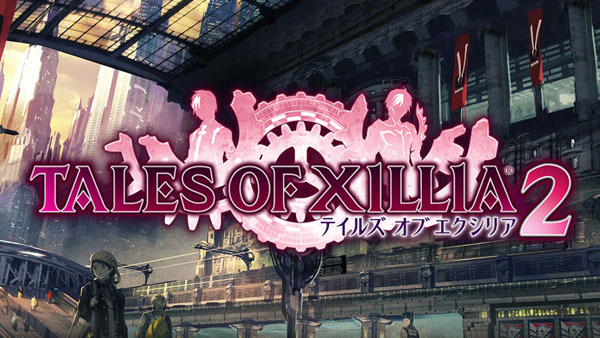 Even though we were trying to make the stakes greater, on a personal level, it actually felt like the stakes were lessened.” To get back some of that feel, The Coalition settled on a story featuring three protagonists that stretched over a single span of 24 hours. Getting closer to their characters has allowed the studio more time to focus on their development, as well as the theme of lineage, something that will no doubt be an important thread in the narrative of Gears of War 4. But that’s not to say that Gears 4 is looking to be a retread of the 2006 original. While The Coalition don’t want to reinvent the wheel, there will be plenty of new stuff to look forward to. First off, the eradication of the Locust Horde means our heroes need an all-new threat to combat, and we now know they’ll be called The Swarm. We’ve already seen one example of this mysterious new force, the agile Pouncer from the E3 gameplay demo, and there’ll also be at least two new creatures to go along with them. The first are Juvies, fast, agile pale humanoids that rush you down to force you out of cover, and are capable of evolving into another new enemy type, the Drone. Named for their counterpart in the Locust army, these hulking monsters are capable of using guns and will likely make up the bulk of The Swarm’s forces. Hopefully they won’t be too similar to the old Drones we all know so well. Our protagonists have a few new moves up their sleeves as well, mostly focussed around close-quarters combat. “One of the problems we’ve always had was with close cover,” Fergusson told Game Informer. ” Occasionally you’ll get into that situation where two people come onto the same piece of cover and it looks kind of silly. It’s kind of The Naked Gun moment where the two people are throwing their pistols at each other. One of our big things in Gears was never make the avatar look stupid, so we started to talk about how we could improve players’ ability to move over cover.” To achieve this, The Coalition reworked the mantle kick system from the third game, making it easier to clear obstacles in one smooth motion. If an enemy happens to be hunkered down on the other side, they’ll be staggered briefly, allowing the player to use another new feature – the combat knife. This can be used in close-quarters situations to quickly execute stunned enemies, and to that end, you’ll even be able to drag your prey out of cover to finish them quickly or, if you’re out in the open, use a new short-range shoulder charge (which can be seen in the E3 demo) to knock your foes off balance. 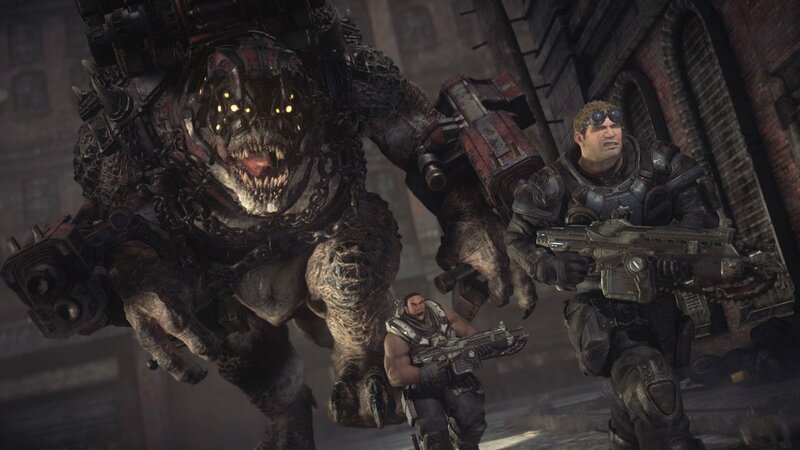 With Gears vet Rod Fergusson heading the studio, and with The Coalition’s sterling work on Gears of War: Ultimate Edition under their belts, it feels like Gears of War 4 is in the right hands. “We have to do it right before we do it different,” said Fergusson. “That’s the message I came to The Coalition with. 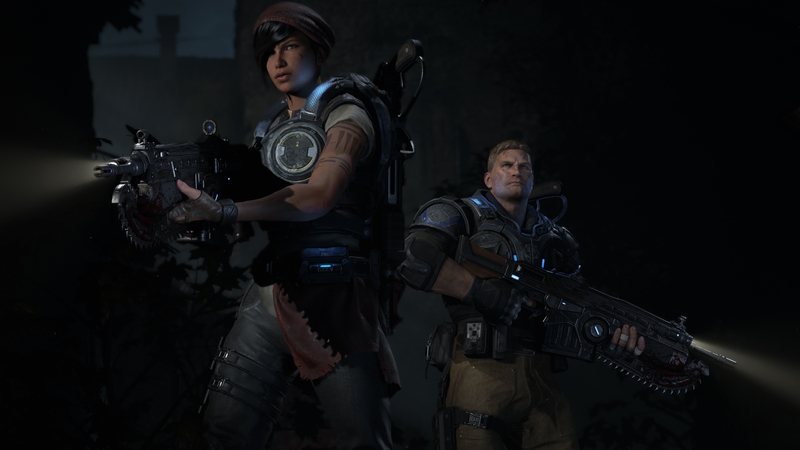 We were new stewards to the franchise, and we had to show that we respected the franchise and that we knew the franchise before we went off and did something crazy.” From what we know of Gears of War 4 so far, it’s sounding like it’ll be an exciting mix of the familiar and the crazy – exactly what we need for the return of one of the last generation’s classics. EPIC! 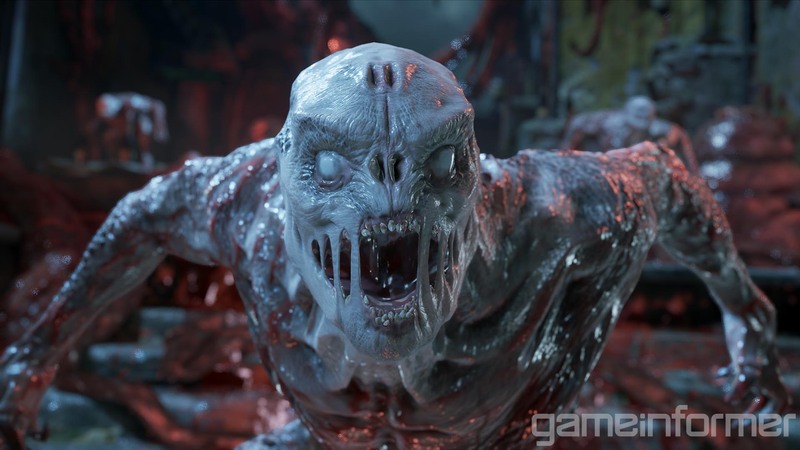 Game Informer outs new Gears of War! Game Informer have revealed the cover of their next issue, and taken the opportunity to announce the next title in Epic Games’ Gears of War franchise. 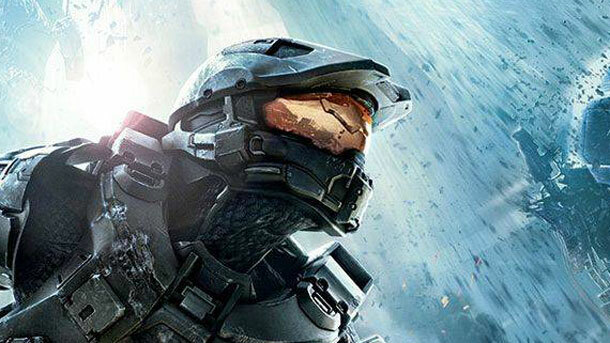 Set to be fully revealed at Microsoft’s E3 conference on Monday, the game will, naturally, see release on the Xbox 360. 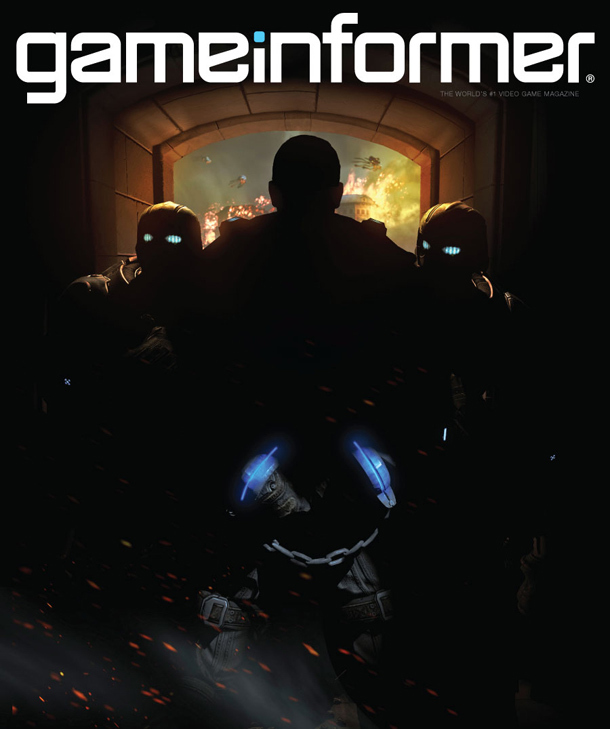 Game Informer’s cover image shows a man in chains, with scenes of Locust Reavers destroying buildings in the background. 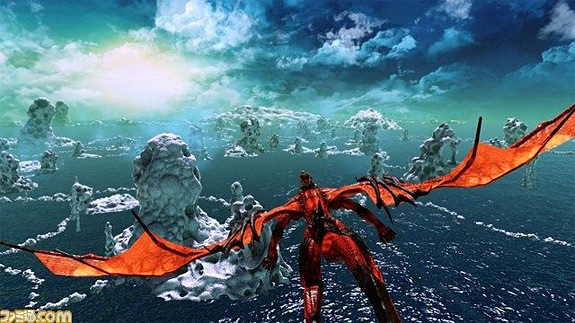 Could this be the battle of Ephyra taking place in the background? And could the man in chains be series protagonist Marcus Fenix, being led away after deserting his post to save his father? This seems to be the obvious conclusion to jump to, but perhaps Epic will surprise us at E3. Honestly, I didn’t see this one coming, at least not yet. But I’m always up for more Gears! Roll on Monday! See the magazine cover below.